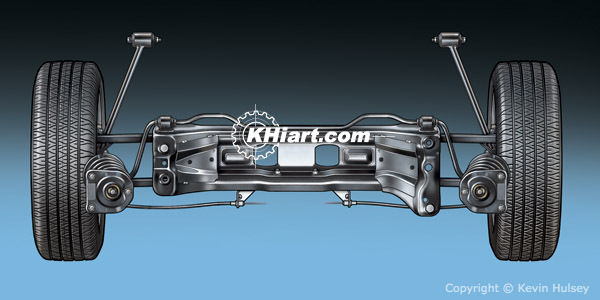 The illustration above depicts a typical car's front suspension unit with passenger and driver's side multi-link control arms plus a rack-and pinion steering unit. 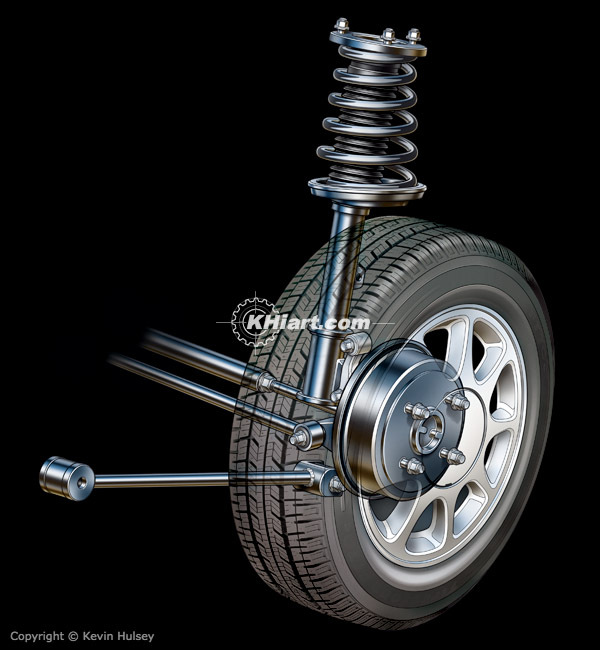 On this portfolio page we have a collection of vehicle suspension illustrations, rack-and-pinion steering components and drum brake or disc brake components. 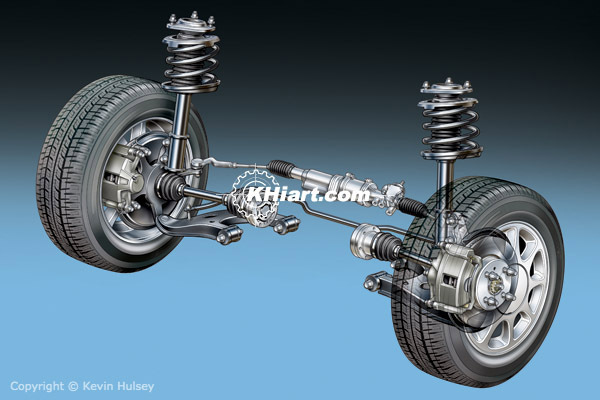 The above illustration of a passenger car's front multi-link suspension showing upper and lower control a-arm links, shock tower, stabilizer bar, sub-frame, front disc brake and wheel. This illustration shows the front and rear suspension in a typical 4-door passenger car. This overhead top view illustration shows an isolated passenger car's trailing-link rear suspension with stabilized sway bars, coil springs, tires and wheels. 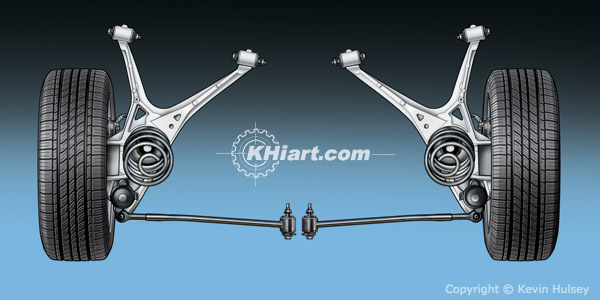 This image shows a line-and-tone illustration of a simple rear suspension configuration with a solid single beam that is sprung with coil springs and fluid shocks. This suspension unit has basic drum brakes and would be used in a typical economy car. 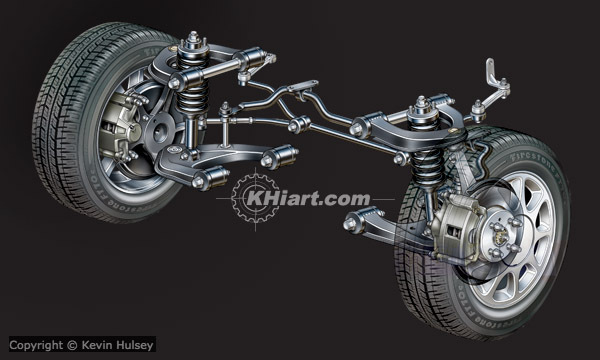 The next top view illustration shows a car's isolated multi-link rear suspension unit with sway bars, coil springs, sub-frame, tires and wheels. 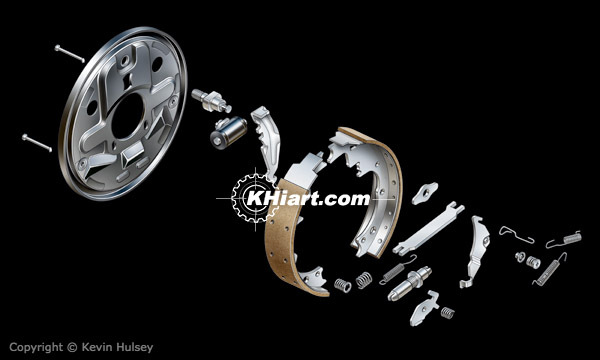 The above illustration shows various automotive disc braking components such as the disc rotor, caliper and composite brake pads with retaining springs. 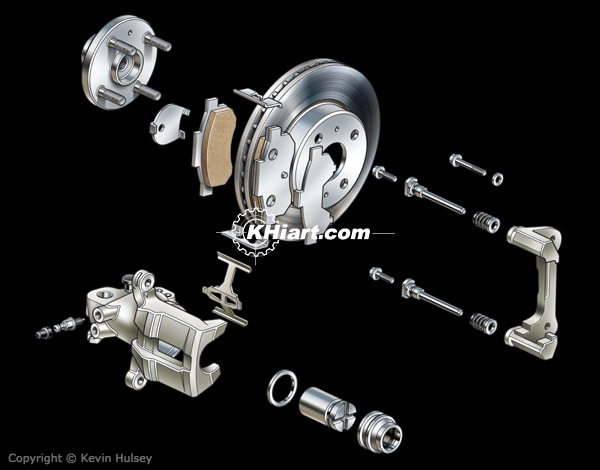 The above illustration shows a typical economy car's drum braking components such as the brake drum, brake shoes, adjustment devices and retaining springs. 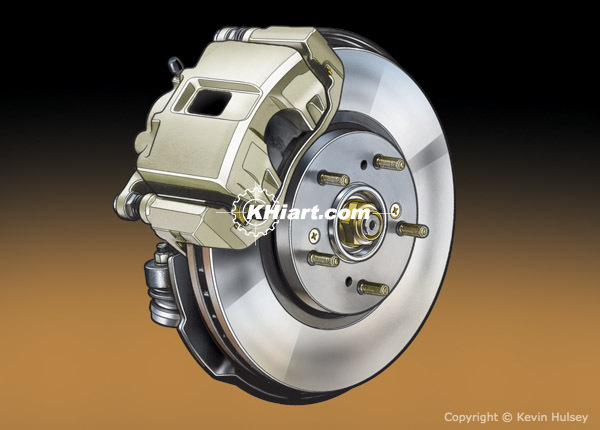 The above illustration is of a car's isolated fully-assembled front disc brake. 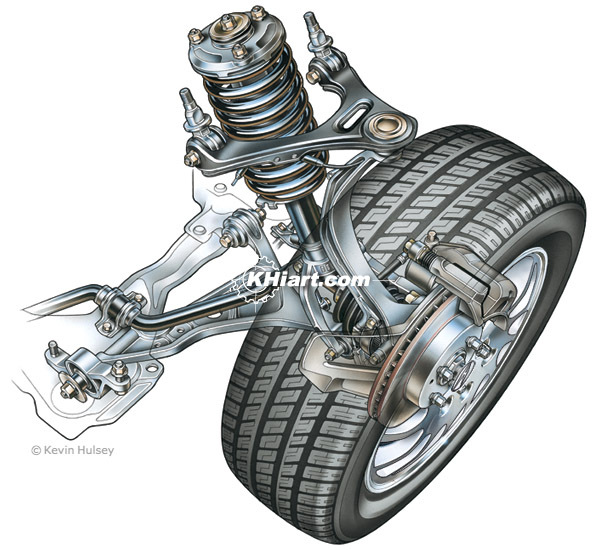 This isolated illustration shows a car's basic rear suspension and drum brake which is ghosted through the tire and wheel. 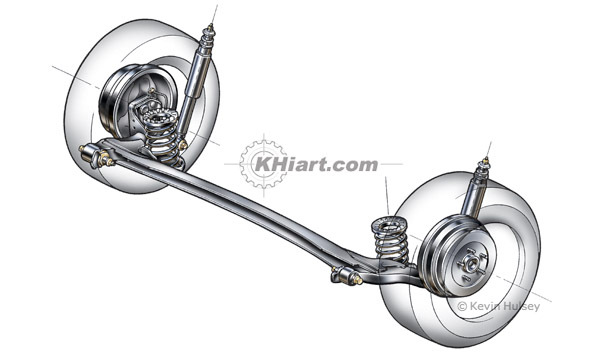 This isolated illustration shows the front suspension from a heavy-duty pickup truck. 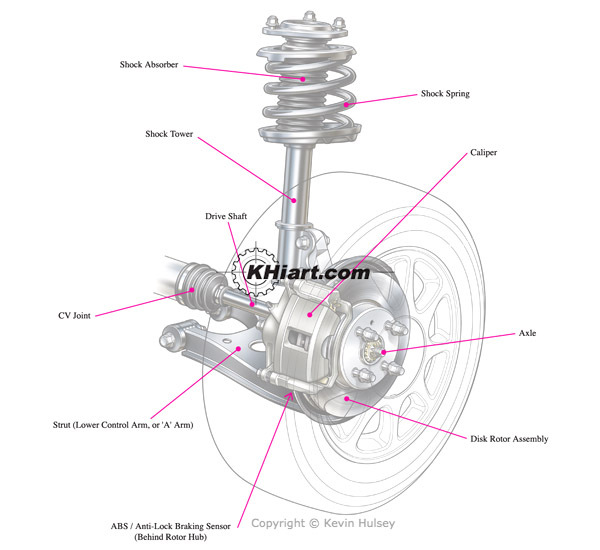 This diagram illustrates a passenger car's front suspension with callouts to individual components such as the lower control arm strut, disk rotor, axle, caliper, shock spring and shock absorber and front wheel drive components. 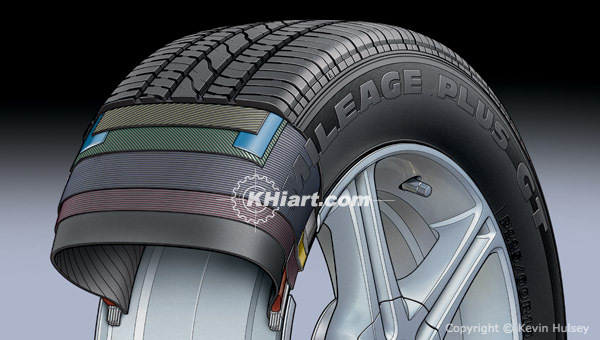 This illustration shows a cutaway of a radial Hankook Mileage Plus GT car tire. Please contact us for a complete list of automotive stock images and car stock image pricing.